Samsung today unveiled the Galaxy S8 and Galaxy S8+ at an event in New York City. Both models feature the curved Infinity Display found on the Galaxy Note, marking the first time since the Galaxy S6 Edge was released that there won't be a flat version of Samsung's flagship smartphone. The Infinity Display isn't as dramatically curved as the display on the original Galaxy S6 Edge, which included more interactive features directly on the edges. Instead, the Infinity Display features slightly tapered sides, with an unobtrusive, fly-out menu that can be customized. 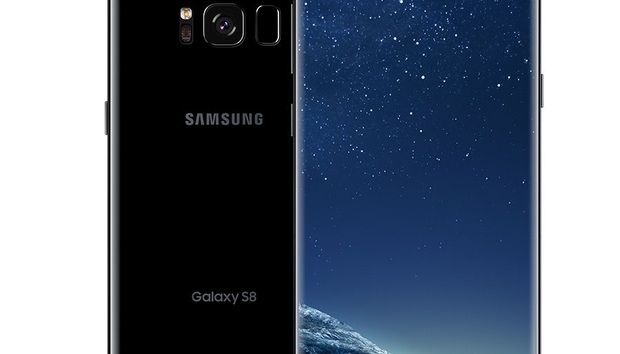 The Galaxy S8 features a 5.8-inch Quad HD+ Infinity Display with a resolution of 570ppi, while the Galaxy S8+ has a 6.2-inch Quad HD+ Infinity Display with a resolution of 529 ppi. Both devices house 4GB of RAM and an Octa core processor -- but upon release, processors might differ depending on region or carrier. Both devices remain slim and compact -- they are also narrower than their predecessors by mere millimeters, which should make them easier to hold in one hand if you found the S7 or S6 too wide. The Galaxy S8 measures 5.8 x 2.7 x .3 inches and weighs .34 pounds, while the S8+ measures 6.2 x 2.9 x .32 inches and weighs .38 pounds. Another big change to the standard display is the lack of a physical home button to make room for a larger display. Instead, a virtual home button appears on the screen, along with haptic feedback to give the feel of a physical button. Both devices feature a headphone jack, expandable storage, USB Type-C charging and are water and dust resistant. The rear-facing 12-megapixel camera on both the S8 and S8+ remains mostly the same, except Samsung improved the autofocus for faster performance. The front-facing camera on the S8 and S8+ has been bumped from 5-megapixels to 8-megapixels. The 3,500mAh battery in the S8+ is slightly smaller than the 3,600mAh battery in the Galaxy S7 Edge, but a more efficient processor is expected to compensate for any discrepancies in battery life. The Galaxy S8 will feature a 3,000mAh battery -- the same as the Galaxy S7. Without a physical home button, the fingerprint scanner is relegated to the back of the device, next to the camera. But if you find the location awkward, Samsung also includes facial recognition in the front-facing camera. Samsung Knox will allow for more security configurations. For example, you can choose to unlock your smartphone one way and protect other apps and data using another security option. Businesses that opt for the Galaxy lineup will also get the air bulk configurations, an "out of the box experience" and the capability to deploy persistent settings across devices. Samsung wants to make it easier for business users to keep one phone for both work and play by expanding enterprise features alongside consumer features. Samsung's virtual assistant, Bixby, offers some unique features including a push-to-talk button on the side of the device, which will automatically wake the phone to deliver an immediate response. With Bixby, you can take photos of objects and products to find them -- or similar items -- online. Bixby can also translate languages using a photo, but it remains to be seen how well this feature will work in practice. Bixby includes smart reminders based on your location or your routine, and as it learns more about your routine and lifestyle, it will curate different recommendations. That might include calling someone on your ride home from work or suggesting restaurants in your area that you will enjoy. It also integrates well for anyone with Samsung home devices -- especially TVs and smart appliances. For example, you can use Bixby to dim lights, automatically play videos on a connected Samsung TV and more. Samsung DeX, also announced today, is a workstation dock that will turn your S8 or S8+ into a fully functioning desktop. With the dock, the Android operating system converts into a familiar desktop experience, similar to Windows 10, and allows you to connect to an external display, keyboard and mouse. Samsung's apps as well as some third-party apps have been optimized to work with DeX. So far that list includes Microsoft Excel, Microsoft PowerPoint, Microsoft Word and Adobe's Lightroom app. Other apps will be optimized for the desktop experience, but apps that aren't optimized will still open in the mobile format. The Galaxy S8 and S8+ will be available for pre-orders starting March 30 and carriers will start stocking the device starting April 21; no word yet on pricing.